Have you ever used Emu Oil? I have been using it for over 6 months now and it has some great moisturizing properties. I was really unsure about using an oil on my naturally oily skin. Turns out it’s still a really great moisturizer. Read up on my initial reactions after only a few weeks using emu oil. The lovely folks at Koru Naturals shipped me a second bottle of the Emu Oil, for free, after I worked my way through the first one. Being able to use this product for 6 months really allowed me to try all of it’s uses. I want to say thank you to Koru Naturals for allowing me to try their product for free, in exchange for my posts! This may sound weird, but after shaving my legs, emu oil really helps restore moisture to my skin. I haven’t had Patrick give it a try on his face, but I think he’d like the end result, though he’d be weirded out by the oiliness of it. As long as I have some time to wait before getting dressed, spreading a little emu oil on my freshly shaven legs really helps keep the dryness away. As an oily hair person I really struggle adding oil into my cleaning routines. However, a tiny dollop of emu oil, rubbed between my palms and then spread through the ends (and I mean only the bottom 5cm) of my hair really smooths out my look. I don’t do this often because I rarely spend any time on my hair. (I’m a wash and wear person.) I’ve convinced myself it helps prevent split ends, though I have no scientific data to back that up! This is my favourite use for emu oil. Apply to your freshly washed face and let it sit a few minutes before you get into bed. If you’re worried about getting the oil on your pillowcase, cover it with a towel. I haven’t had any issues but there have been nights where I’ve put “too much” on and so tried not to roll onto my side until it feels more absorbed. I never have gross pillowcases in the morning though. In the morning my face always looks hydrated and fresh. I want to use the phrase “plumped up” but that doesn’t sound right. I can see a decrease in my fine lines around my eyes, but it’s a temporary effect. I do feel overall more hydrated when I use it every day. I even rub the excess on my hands and nail beds, and sometimes put on gloves overnight to save the moisturizing effect for my fingers. Emu oil has so many great uses. 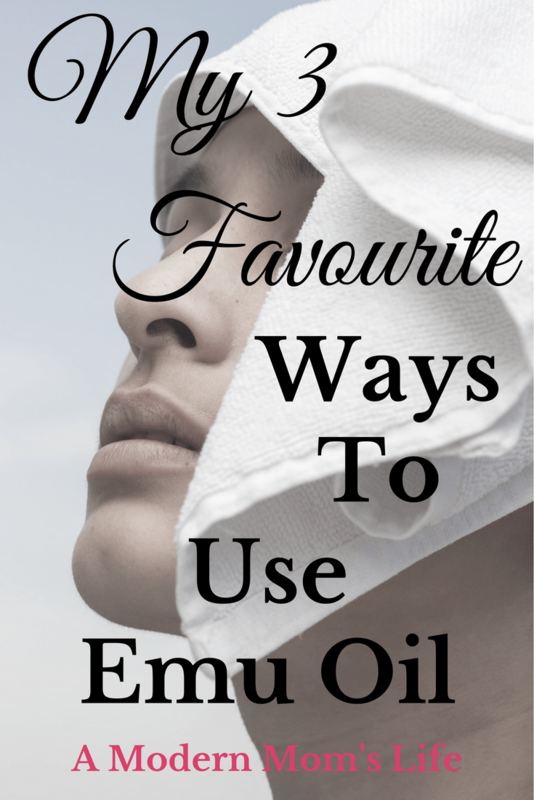 If your skin tends toward dryness I would strongly recommend giving Emu Oil a try. If it can help me out (with my oily skin) imagine how great it would be for your dry or combination skin! You can pick up a bottle here. If you have a product or service you would like promoted on A Modern Mom’s Life, please visit my Work With Me page. Also feel free to contact me with ideas for other ways we can work together.